The Cherry Creek School District in Colorado has been using GIS in the curriculum and in administration for many years now. When the STEM coordinators of the district told me recently that their students were launching weather balloons and recording atmospheric data from them, I jumped at the opportunity to show them how easy and powerful it is to map the data in ArcGIS Online. The data from just one of the many balloons they had launched was stored in a standard spreadsheet and contained latitude and longitude coordinates, and therefore was a snap to map in ArcGIS Online. This particular balloon, launched on 1 May 2015, flew over 56 miles (100 km) in 3 hours and 6 minutes, reaching a maximum altitude of 30.7 km, recording a minimum temperature of -59.3 C and achieving a maximum speed of 114 km/hour. I mapped the balloon based on its height on a satellite image base, which you can examine in ArcGIS Online by clicking on the map below. 2D map of weather balloon mapped by speed in ArcGIS Online. 3D scene of weather balloon at its launch point mapped in ArcGIS Online. The track of this particular balloon followed the typical west-to-east prevailing winds, but as it neared the tropopause, it encountered stronger winds from the southeast, that not only blew it in the opposite direction, but also blew it higher in the atmosphere. 3D scene of weather balloon mapped by height in ArcGIS Online, looking southeast. What excites me not only is the ability of these tools to map the data that the students are collecting, but the power that they offer in terms of helping students understand the relationships among all of these variables. The variables in this case included altitude, speed, heading, and temperature, but other data that the students have collected include atmospheric quality characteristics. GIS provides a fundamental component of the district's STEM goals, perspectives, content knowledge, and skills. Another thing about this project that excites me is that -- Grade 5 students are the ones engaged in this project--yes, 11 years olds, collecting and analyzing data! Think about the kinds of data that you and your students work with. It may not be weather balloon data, but it occurs over space and time. How could you use ArcGIS Online and the 3D scene viewer to map and understand your data? I have recently updated a document entitled "Why GIS in Education Matters" and have placed it online. It represents my attempt to provide the most compelling and important reasons to teach and learn with Geographic Information Systems in a concise document that takes up no more than both sides of a single page. While we have discussed other documents, messages, lessons, and videos in this blog over the years that are tailored to specific educational levels, needs, and content areas, this document contains the "essentials" that I have found resonate with the widest group of educators. These essentials include critical thinking, career pathways, spatial thinking, the whys of where, asking good questions, sustainability and green technology, and mapping changes over space and time. I am interested in your reactions to this document: What is missing from this document? What is useful about this document? In what settings could you use this in your own work with fellow faculty, with faculty from other disciplines, with administrators, with parents, and with students? What do you include in your own documents with similar goals? Why GIS in Education Matters, brief document outlining the value that teaching and learning with GIS brings to education. This book is an initiative presented by the Commission on Geographical Education of the International Geographical Union. It focuses particularly on what has been learned from geospatial projects and research from the past decades of implementing geospatial technologies (GST) in formal and informal education. 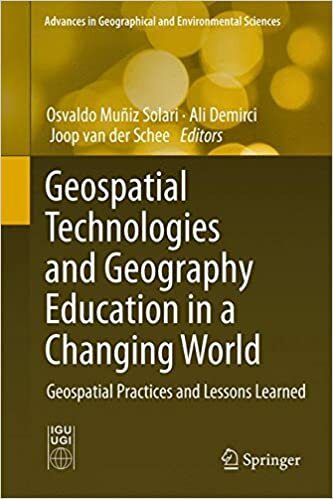 The objective of this publication is to inform an international audience of teachers, professionals, scholars, and policymakers about the state of the art and prospects of geospatial practices (GPs) as organized activities that use GST and lessons learned in relation to geographical education. GST make up an advanced body of knowledge developed by practitioners of geographic information systems (GIS), remote sensing (RS), global positioning systems, (GPS), and digital cartography (DC). GST have long been applied in many different sectors; however, their first use in higher education began in the early 1980s and then diffused to secondary schools during the 1990s. Starting with GIS and RS, it evolved into a much broader context, as GST expanded to include GPS and DC with new communication technologies and Internet applications. GST have been used around the world as a combination of tools and special techniques to make research, teaching, and learning more effective. Contributors include Joop van der Schee, Sarah Bednarz, Niem Tu Huynh, Thomas Jekel, Lara Bryant, Karl Donert, Tom Baker, Joseph Kerski, Reed Perkins, Jung Eun Hong, Bob Sharpe, Injeong Jo, Marsha Alibrandi, and several others.